Along with our exceptional service, we also offer award-winning products! The UK’s first choice for anti-slip coating, resin bound aggregates, resin bonded driveways, Road Surfacing, Epoxy flooring, Footbridge Surfacing specialist coatings, decorative surfaces and drives. The company was formed in 2004 and has steadily increased project diversity and revenue growth in recent years. We draw on over 30 years experience in the thriving ‘specialist surfacing’ business, this coupled with our dynamic project management skill and cost analysis, we are confident in delivering timely results to a budget. Thortech has a broad spectrum of clientele, servicing multi-nationals, local authorities, SME’s and individual/residential clients. We cover a range of areas including bridges, marine, ship decks, Ports, car parks, pathways, driveways, helipads and virtually everything else were safety surfacing is important. 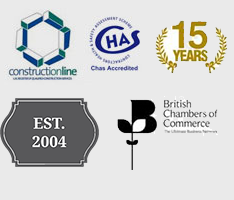 We find our success is largely down to our comprehensive product range and tailored consultation, so whether you’re after basic material supply, sub-contracting or complete project management then look no further. Thortech understand the importance of Health and Safety in the current climate. All Thortech Operatives possess current CSCS cards, with rail operatives in possession of current PTS Cards. Supervisors have passed SSSTS courses, with management attaining NEBOSH status. The UK’s first choice for anti-slip coating, resin bound aggregates, resin bonded driveways, Footbridge Surfacing specialist coatings and decorative surfaces! Thortech has a broad spectrum of clientele, servicing multi-nationals, local authorities, SME’s and individual / residential clients. We cover a range of areas including bridges, marine, ship decks, Ports, car parks, pathways, driveways, helipads and virtually everything else where safety surfacing is important. We find our success is largely down to our comprehensive product range and tailored consultation, so whether you’re after basic material supply, sub-contracting or complete project management then look no further. Thortech Urban would be the best option to chose if you are looking for a surfacing solution for urban areas such as; pedestrian pathways, playgrounds, roads and driveways. We provide imprinted Asphalt, Resin Bound and Resin Bonded surfacing systems, each with their own advanced, customisable properties. If you are looking for a surfacing solution that is a little more unique, then look no further. We can also offer to place patterns of your choice into the surface. Thortech Bridges & Marine would be the best option to choose for bridges and marine deck systems. We use anti-slip and anti-skid systems to ensure the safety of our customers whilst making the surface aesthetically pleasing. Whether it’s a bridge, linkspan, pontoon, Ro-Ro, PCTC, ship/marine deck or parking deck, anti-skid systems are almost always used in some form. Our anti-slip and impact resistant systems may be applied to steel, concrete, tarmac and wood and are designed to manage large volumes of traffic. Whether you’re in need of a single or multi-layered system, our polyurethane surfaces are also fast curing and will, therefore, provide minimal disruption to opening.